The minister said the decision was ill-conceived and should be ignored by Ndigbo as it’s a decision propelled by PDP members in Ohaneze Ndigbo, hurriedly taken to drum support for their party members in the coming election. Ngige expressed disappointment that the apex Igbo socio-cultural organization would degenerate into meddling playing partisan politics, adding that the people of South East have spoken in the rally held at instant of hundreds of thousands Igbo citizens in Enugu and Onitsha, where the people gave their support to return President Muhammadu Buhari as president come March 16, 2019. Meanwhile, the leadership of the Ohaneze Ndigbo youths wing worldwide has commended the decision of their parent body for endorsing the joint ticket of the People’s Democratic party presidential candidate Alhaji Atiku Abubakar and his vice Sir Peter Obi as the choice of Ndigbo in the February 16th 2019 presidential election. Addressing journalists in Enugu after their meeting, the national president of the Ohaneze Ndigbo youths wing worldwide, Amb. Dr. Arthur Uchenna Obiorah expressed hope that the decision of the Ime-Obi of Ohaneze Ndigbo worldwide will restore confidence in the minds of Ndigbo to now openly declare their support the presidential candidate of the PDP in the February 16TH presidential election. 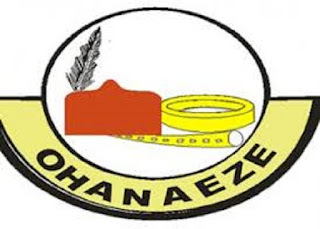 The Ohaneze Ndgibo youths wing worldwide wing further deliberated and resolved that henceforth the union will commence action to ensure the resolutions reach by the Ime-Obi of Ohaneze Ndigbo is given a firsthand charge to ensure its impact is felt in the 7 Igbo speaking states of Nigeria .